As they say: One Good Bar Deserves Another—and many French Quarter Hotels are creating music venues where a bar once stood alone. These provide additional opportunities for local musicians and a welcome respite for weary travelers waiting for their room or meeting another guest. The Sheraton on Canal (at Chartres) hosts the annual New Orleans Jazz Club event between the two weekends of the Jazz & Heritage Festival at the end of April. Tim Laughlin has performed there for the past several years in the gigantic lobby and Pelican Bar boasting its multiple storied ceiling. It is fun to watch the hotel guests enjoying traditional music with his A++++ band members. The Sheraton Four Points on Bourbon (at Toulouse) is the site of the original French Opera House—in existence from 1859-1919 before a disastrous fire demolished the building. The Puccini Bar offers live music Thursday through Sunday from 6:00 pm to 9:00 pm with a small group or solo piano. On the 2nd and 4th Wednesdays an opera group—Opera On Tap—performs from 7:00 pm to 9:00 pm to highlight the original offerings of that location. The Hotel Conti (at Dauphine) offers the Bombay Club with excellent martinis and small bites, although a complete dinner is available. There is live music every evening showcasing traditional and classic jazz with a trio or solo piano. Tim Laughlin (cl), Duke Heitger (tp), Don Vappie (gtr, bj), Banu Gibson (v) may be performing along with pianists David Boeddinghaus, Matt Lemmler, Josh Paxton, Steve Pistorius, John Royen, or Kris Tokarski as featured musicians. This is a small venue but always well attended. Reserve a table to guarantee seating close to the band and enjoy the United Kingdom atmosphere. The Bourbon Orleans has transformed their bar area into a welcoming venue—the Bourbon O—with the evening’s band set up in the corner windows and visible from both streets. The expanded area is in the heart of the Quarter open to all tourists and hotel guests. It is lively and most nights will feature a 3-6 piece band and vocalist. Joe Goldberg (cl) is often on Thursdays, Doyle Cooper (tp) and his band have a standing date on Fridays, Marty Peters (cl) & the Party Meters are on Saturdays. If you haven’t seen what Chance Bushman can do with a 3’ x 3’ portable plywood board, you will be amazed. This dancer, singer, instructor, percussionist is pretty much responsible for the wave of dancers, dance lessons and dance contests that have permeated the Quarter over the past 10 years. He might be at the Bourbon O one night and someplace else the next, but always tapping, dancing, singing and generally wowing the audience. A consummate entertainer, Chance has the personality and talent to draw a crowd and keep them smiling! The Roosevelt Hotel just west of Canal at Burgundy provides entertainment in the Fountain Lounge. Celebrating 125 years of ultimate accommodations and dining, the Roosevelt is a New Orleans icon. With three bars in the hotel itself, the Fountain Lounge regularly features local talent. With a storied past, this Hotel was home to movie stars, political heavyweights and international glitterati, especially in the Blue Room, a Sinatra favorite. It is a beautiful, charming venue and a stroll through the extended “lobby” from one street to the next is a delightful adventure. We saw Wendell Brunious (tp) and Tom Hook (p) one evening in the Fountain Lounge and thoroughly enjoyed this dynamic duo. 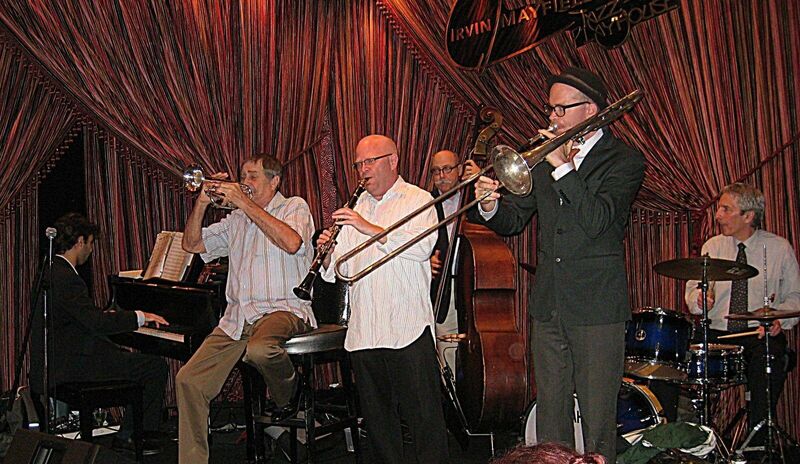 The Royal Sonesta’s Jazz Playhouse on Bourbon (at Bienville) hosts many groups throughout the week. This is an upscale venue that was formerly known as Irvin Mayfield’s Jazz Playhouse. There is a Friday night Burlesque performance at 11:00pm—a throwback to the sophisticated productions of the 1920s. Songstress Germaine Bazzle, a local icon, holds court on Saturdays while Gerald French and the Original Tuxedo Brass Band play on Mondays. Many other musicians are featured during the week. The classic Carousel Bar in the Monteleone on Royal (at Iberville) is one of the most famous bars in the Quarter. Its intricate, revolving 25-seat Carousel now anchors an expanded bar area that includes several sections for visitors. The large stage can accommodate any size group and there is nightly live entertainment. The Ritz-Carlton on Canal (at Dauphine) boasts the Davenport Lounge with Jeremy Davenport (tp) as the host entertainer. The live music venue has early evening sets on Wednesdays & Thursdays with later sets on Fridays & Saturdays. After 48-1/2 years, Shelly Gallichio is a retired Real Estate Associate Broker in Tucson, Arizona and despite growing up in Chicago, fell in love with the clarinet and the New Orleans sound at the age of three—she intends to spend the next 48-1/2 years seeking that sound!